What is the most spectacular lake you have ever seen? Mine would be Lake Tahoe, though Lake Baikal in Siberia would be a close second. Third, would be Lake Lucerne in Switzerland, and fourth, Lake Coeur d’Alene in Idaho. Tahoe is close, less than three hours drive from the Bay Area, in good weather. Most of us Californians have been there dozens of times, either to ski in winter, or play in the summer. But what do yo really know about this famous lake? The maximum depth is 1645 feet, the second deepest lake in the U.S. (Crater Lake in Oregon is 1932 feet). There is enough water in Lake Tahoe, 39 trillion gallons, to supply everyone in the U.S. with more than 75 gallons of water per day for 5 years!! The Tahoe shoreline extends 72 miles, with a total surface area of 191 square miles. 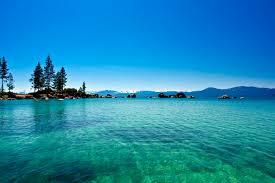 If you emptied Lake Tahoe, it would submerge the state of California under 15 inches of water! The lake is 22 miles long, and 12 miles wide. In other words, Tahoe is as long as the English Channel is wide. 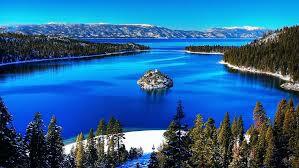 The average elevation of Lake Tahoe is between 6223 and 6229 feet. The top 6 feet, 1 inch of water is controlled by the dam in Tahoe City, and holds up to 244,600 acre feet of water. Don’t get any ideas, as the average water temperature is 42.1 degrees F. The average surface water temperature is 51.9 F. The average snowfall is 409 inches. The lake is 2 million years old, and gets 3 million visitors annually. It was a mere 3 to 5 million years ago, when the valley that became the Tahoe Basin sank between parallel fractures in the earth’s crust. The mountains on both sides continued to rise, allowing a shallow lake to form in the valley. Then, erupting volcanoes blocked the outlet, causing the lake to rise hundreds of feet, until it eventually eroded down to near its current outlet. The Tahoe Basin is mostly granite, with very little topsoil. As a result, very few nutrients have washed into the lake. creating a lake without the murkiness caused by algae and other organisms. In addition, 40% of the precipitation falling into the Tahoe Basin lands directly on the lake. The rest drains through decomposed granite soil, creating a natural filtering system for the water. On the down side, urbanization has eliminated 75% of the marshes, 50% of the meadows, and 35% of its stream zone habitats. Almost 85% of all wildlife in the Basin use these habitats. 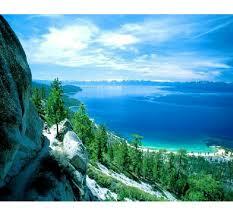 Two-thirds of Lake Tahoe resides in California, and about a third in Nevada. Two hot springs lie beneath the surface, with another 63 streams feeding the lake. The Truckee River is the only outlet, flowing from a dam in Tahoe City, then east through Reno. It finally drains into Pyramid Lake in the Nevada desert, where it evaporates into the atmosphere. The beautiful blue color of the lake is caused by other colors in the light spectrum being absorbed, while blue light is reflected back. This gives the appearance of a deep cobalt blue, ranging to a beautiful, glistening turquoise. The clarity of the lake has been an issue for locals in the area, as well as most Californians. Clarify is measured to the point where a 10 inch white disk disappears from view. Clarity was measured at over 102 inches in 1968. The lowest average depth on record was 64 inches. In 2013, the depth was measured at 70 inches. The lack of clarity is blamed on microscopic sediments entering the lake, as well as algae growth fueled by both nitrogen and phosphorus. If you want to learn more about Lake Tahoe, visit terc.ucdavis.edu and the Tahoe Environmental Research Center, U.S. Geological Survey, U.S. Forest Service. A little known fact, the Lake was named Mountain Lake by John C. Fremont, then Lake Bonpland (in honor of the French botanist), then Lake Bigler in 1857 in honor of Governor John Bigler, before it was renamed Tahoe in 1945.